Trails Illustrated Mount Baker Boulder river Wilderness Area [TI826] - $10.95 : Trail Explorers Outpost, Keeping the Adventure Alive! 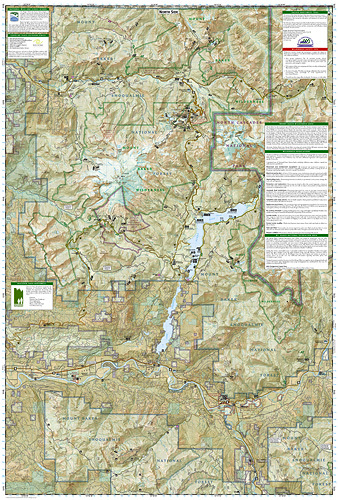 One of five new Trails Illustrated maps for the Washington Cascades region offering the most detailed and up-to-date map for the forest, carefully researched and developed in co-operation with local land managers and agencies. Each map contains easy to read trails, numbered forest service roads, campsites, access points, scenic points-of-interests, and important facilities. Three narrow spires--North, Middle, and South Peaks--known collectively as Three Fingers anchor the center of Boulder River Wilderness. Boulder River, the primary drainage, runs northwesterly from a north-south ridge that rises to a high point of 6,850 feet on South Peak. Mountain climbers flood onto Mount Baker Wilderness Area in spring and summer before fall opens numerous large crevasses. Hundreds of climbers may be seen on the mountain in a single day. The Heliotrope Ridge Trail winds 2.7 miles to the Coleman Glacier, the most popular climbing route on the mountain. A well-developed and very busy trail system provides access to the lower country.